Automatic, 16 head, rotary, piston filler capable of filling up to 240 containers per minute. Containers: up to 5" diameter x up to 12"H. Currently equipped with 2.5oz pistons. wormscrew to starwheel infeed, starwheel discharge, 6"W x 5 1/2"D platforms, 1/4" diameter fill nozzles, 50 gallon product tank with float valve, 3" diameter tri-clover product inlet, E-stop, hand crank volume adjustment for all pistons, volume adjustments for individual pistons, neck centering guides, and no container / no fill. Mounted on frame with height adjustable feet and stainless steel guarding. With proper change parts, fill volume up to 35oz. Automatic, 16-head rotary, piston filler capable of up to 240 fills per minute. Currently equipped with 2.5oz pistons. Containers: up to 5" diameter x up to 12"H. Has 3 1/2"W conveyor frame, worm screw to star wheel in feed, star wheel discharge, 50 gallon product tank, neck centering guides, 3/8" diameter nozzles, fill accuracy +/- 0.5% by volume, mechanical container height adjustment, no container / no fill, gauges for changeover, and barrier guarding with electrical interlock. Fills: up to 35 oz (with proper change parts). MRM Elgin, stainless steel incline cleated belt feeder with amount of product per hour – depending on materials an application. Equipped with 30½" wide x 36" long x 22" deep (14 ft³) stainless steel product hopper, 13" wide belt conveyor with 3/16" high cleats set on 3-3/16" centers, 77" discharge height with 2¼" wide chute and 77" ground clearance. Powered by .89 hp motor drive. Mounted on stainless steel base frame. MRM Elgin, automatic, stainless steel, 24 head rotary pressure gravity filler. Rated from 40 to 240 containers per minute – depending on materials, application and machine configuration. Container size: up to 4" in Diameter: up to 9½" in Height with proper change parts. Equipped with a wormscrew to star wheel in feed and star wheel discharge, 38" diameter table with (24) ½" OD stainless steel nozzles set on 4" centers, centrifugal product pump, holding tank floating level sensor, no container / no fill and variable speed controller for pump and filler. Mounted on stainless steel base frame with drip pan. MRM Elgin, semi automatic, single head piston filler. 48 oz per full stroke, cam operated. 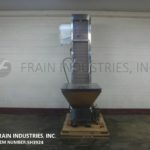 Equipped with a 22" diameter x 24" deep agitated product hopper, 12" long x 3" diameter piston, 84" long single chain lugged conveyor set on 5" centers, end tamping and foot pedal operation. Automatic, intermittent motion 4 piston in-line filler. Equiped with 3-1/4" wide x 87" long conveyor, pneumatic indexing system, four (4 oz) pistons with 1/4" nozzles and 18 gallon hopper. Stainless steel contact parts. Speed dependant on material, application and machine configuration. MRM Elgin, automatic, 24 head, stainless steel, rotary, fill to level filler, rated from 48 to 240 containers per minute – depending on materials, application and machine configuration. Container size: up to 4" in Diameter: up to 9-1/2" in Height (with proper change parts). Equipped with worm screw to star wheel in feed and discharge, top gear drive and 40" OD table with (24) 3/8" OD stainless steel nozzles set on 4" centers, bottom up fill, no container / no fill with vari-speed contoller and centrifugal product feed pump. Control panel has machine, filler, belt, start, stop and e-stop controls. Mounted on (4) leg stainless steel base frame with safety guarding. MRM Elgin, Model Twin, automatic two head inline piston filler. Rated from 10 to 40 cpm – depending on materials, application and machine configuration. Equipped with a 7½" wide x 75" long Delrin conveyor, 3" ID flanged product inlet, (2) 4" diameter x 12" long (64oz) pistons, (2) ¾" diameter nozzles set on 4" centers. Mounted on a painted base frame with mechanical variable speed controls. MRM Elgin Model Versa filler, automatic, stainless steel, 6-head, rotary time / pressure filler. Rated from 20 to 90 containers per minute – depending on materials, application and machine configuration. Container size range: 1" to 14" in height; 1" to 5½" in diameter. Equipped with a 132" long x 4½" wide stainless steel table top conveyor, starwheel infeed and discharge, (11/16)" OD nozzles set on 5¾" centers and a (1/8) hp positive displacement supply pump. Control panel with push button start / stop controls, variable speed dial and volume control dial. Mounted on a painted base. MRM Elgin, Model RPF-4, automatic, continous motion, stainless steel, left to right, 4 head rotary piston filler rated from 12 to 60 containers per minute – depending on materials and application. Maximum container size: to 9 in Diameter; Height project dependent, all with proper change parts. Equipped with 80" long x 4-1/2" wide plastic Delran container conveyor, with worm screw to star wheel in feed / discharge. 24" OD turret, with (4) 7-1/2" x 5-1/2" container pedestals, (4) filling heads with 3" ID x 9" Long pistons and 3/8" OD x 5-3/4" long stainless steel nozzles set on 15" centers, bottom up fill, with no container / no fill and 48" x 48" stainless steel platform with drip trough, Control panel has A/B CPU and A/B panel view with power on / off switch and start, stop, e-stop push buttons. Mounted on stainless steel base frame with interlock safety guarding and leveling legs.